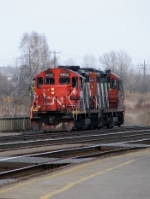 Description: CN 2511 leading a wbnd mixed consist with a GP9 tucked in behind the lead two units under cloudy skies. Description: CN crew member activates the traffic signal preemption at Colborne Street. Description: ACFX 44784 spread the rails and derailed just west of Yorkshire Street. The left wheels are riding along the overturned rail, the right wheels are dragging along the ballast. Description: CN 587 waits for the boss to arrive at Grand River Avenue.